Nuclear power is often touted as a solution to climate change, but Fukushima serves as a warning that far from solving the climate problem, nuclear power may be highly vulnerable to it. First of all, coastal areas are highly dynamic: storms batter, sea levels rise, and land shifts. This already poses problems for the safety of nuclear plants, and is only going to get worse. 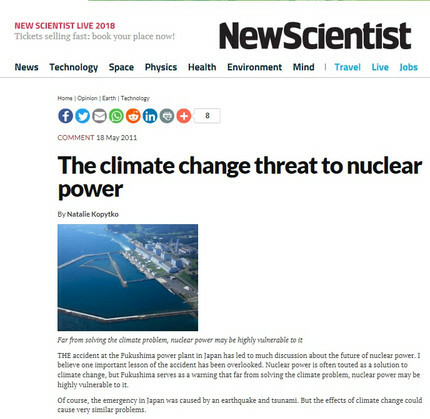 Secondly, nuclear power can be disrupted by water scarcity and rising water temperatures. This is not to say an accident will happen every time a hurricane passes by a nuclear power plant. Unlike earthquakes, hurricanes can be predicted, allowing time for preparation. Still, preventative measures are not always taken. For instance, during hurricane Francis in 2004 doors designed to protect safety equipment from flying debris at the St Lucie nuclear power plant in Florida were left open. Another cause for concern is floods. All nuclear power plants are designed to withstand a certain level of flooding based on historical data, but these figures do not take climate change into account. Floods due to sea-level rise, storm surges and heavy rain will increase in frequency. This isn’t a hypothetical future scenario. In 1999 the Blayais nuclear power plant on the Gironde estuary in France flooded due to a high tide and strong winds that exceeded anything it was designed to withstand. Two of the reactor units on site were severely affected by flooding. Heat waves are another serious concern, for two reasons. One, the colder the cooling water entering a reactor, the more efficient the production of electricity. And two, once the cooling water has passed through the system it is often discharged back where it came from in a much warmer state. During the 2003 heat wave in Europe, reactors at inland sites in France were shut down or had their power output reduced because the water receiving the discharge was already warmer than environmental regulations allowed. Citing “exceptional circumstances”, the French government relaxed the regulations to maintain the supply of electricity. After subsequent heat waves it became a permanent measure during the summer months.